A cabaret-style ballet may not exactly be the first thing that comes to mind when considering Victor Hugo’s famous Romantic novel The Hunchback of Notre Dame, but as this is coming from Roland Petit (1924-2011), high priest of French choreography who obviously could do no wrong, very few will question the necessity to keep it in the running. Last year, the ballet troupe of Milan’s Teatro alla Scala revived Petit’s 1965 creation Notre-Dame de Paris with a stellar leading duo and a seriousness of purpose that would have done the late French master proud. The performance released on home video by Opus Arte is one of La Scala’s live HD cinema screenings. 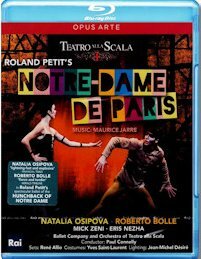 Categories: Blu-ray and DVD reviews | Tags: ballerina, ballet, blu-ray, dance, DVD, La Esmeralda, La Scala, Milan, Natalia Osipova, Notre-Dame de Paris, RAI, Roberto Bolle, Roland Petit, Teatro alla Scala, The Hunchback of Notre Dame, Victor Hugo | Permalink.